"Our" government isn't please with a 91%, it always does it's work with at least 125% results!! That is the reason for our "beloved" comandantepresidente to ask for the expropriations! I would not be so harsh on banks: with 40% inflation and 13% interest I doubt very much that they are making real money... this ain't Wall Street! "by the time we have paid our loan, in real money we may have made as much as 10% instead of paying interest"
You know something is truly wrong when, with two businesses with all things being equal, such as expenditures and income, the more profitable one is the one that borrowed MORE. And your point about expropriation truly is perverse. If you borrow heavily, you end up with very little risk in that case. It's like gambling, in a way, but the system is set up by an idiot, so the house always loses. The only question is how much. And yet if you are an individual trying to get a car loan or just some money to pay off bills it's almost impossible. You need someone to cosign the loan & provide mountains of documents even if you've been a steady client of the bank for 25 years. As a comparison I was able to borrow in my Canadian bank in 20 minutes 10s of thousands of dollars even though I've lived here in Venezuela for 25 years. The difference in attitude is incredible. As usual an important part of European mainstream media ( the BBC), subtly to some, but obviously to others makes Chavez look good. Read the below incredible quote from this BBC article that makes it look like Chavez is preforming a successful and fair agricultural reform and the main critics are the rich and powerful large land owners. "The process of agricultural reform has given many of Venezuela's rural poor the chance to farm for themselves for the first time. But critics - including large ranchers and farmers who have lost their land - say production has suffered as a result, putting pressure on food supplies and prices." 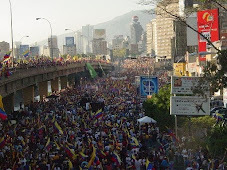 Anybody who thinks that Chavez has lost the international support is living in a fantasy world. The same people (BBC et al.) who now say that Chavez is doing great, will start saying that he deserved what he got the moment he is out of the way. This is what happened with Mubarak, Ceaușescu, Gaddafi, etc. It is my hope that the Castros will soon join this selected group. Nobody in Europe really cares about Venezuela: newspapers just print what the average European wants to read to entertain themselvesw. On the positive side, newspapers here will probably sympathise with the opposition when Chavez loses the next election. Nobody likes losers. Obviously when Chavez nationalizes agricultural loans, production will fall another 10% if not more. I guess Chavez's Cuban advisors forgot to inform him that this scheme doesn't work in Cuba either????? To bad the BBC can't inform their readers of the true problems in Venezuela. Cuban advisors were in Angola during the month of instruction on "Employing increased efficiencies and fair practices in agricultural land ownership". 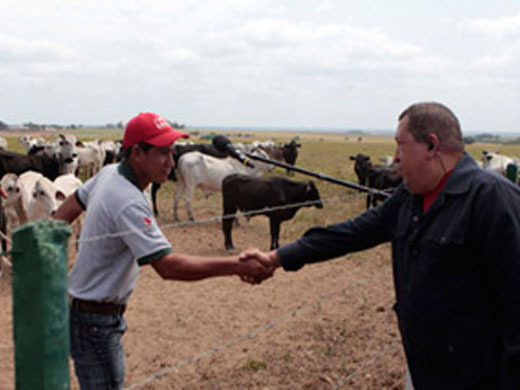 Just curious: how much better was the Agricultural sector in Vzla before Chavez? I know we used to export coffee, but that’s about it, no? Maybe some sorgo, and a few more cows. If memory serves, we’ve been importing a large % of our food even before Perez Jimenez. And, especially after the oil boom in the early70′s, we’ve relied on a somewhat perverse, inadvertent “oil for food” program of sorts. All I’m saying is don’t expect miracle cures after we get rid of Thugo, the Terminator. I get your point and it is precisely that BBC support would only come after it is not needed that actually worries me.I think the power of media to shape opinion through kowtowing to the lowest common denominator( populism) is underestimated.The leftist base needs more counter voices within any publicly funded media, otherwise it becomes more than a bit undemocratic. "The more to believe that today's whole show was an excuse to take away a large chunk of private money in the banks to finance Chavez reelection. And a true expropriation without compensation it will be, a plain highway robbery, "robar" as Maria Corina Machado so aptly put to Chavez on Janaury 13." Daniel -this is I believe the REAL STORY. (And, exactly what I was thinking when reading the #378 Alo Presidente -Chavez's shows his arse again show. First part about agriculture is fantastic. This was a very pofound speech! !